Police say an "armed and dangerous" suspect in a series of crimes in two New England states injured an officer and tried to steal a police cruiser before he was taken into custody Saturday. Investigators had been searching for 32-year-old Michael Munroe of Raymond, New Hampshire, in connection to multiple robberies. The violent crime spree ended Saturday when Munroe and his girlfriend, 29-year-old Rebecca Norton, were arrested in Hancock, a town so quiet, there is only one police officer on duty at a time. Saturday, that officer was Frank Shea. "He was talking with this guy, and then all of the sudden, I saw this roundhouse punch, a sucker punch, come up and hit Frank in the face," said Hancock Fire Chief Nevan Cassidy, who assisted in the arrest, along with other firefighters. According to police, Munroe punched Shea twice, injuring him. At the time, Shea did not know the man was Munroe. "He got in the police car and tried to steal the cruiser," said Hancock Police Chief Andrew Wood. "Luckily, the officer had removed the keys and he wasn't able to go anywhere." "Frank and I pulled him out," said Cassidy. The guy was incredibly strong, and it took both of us to just to pull him out of the car and hold him down." Munroe is accused of robbing a bank Monday in Ossipee. Wednesday, he allegedly carjacked a woman as she left work at the Dress Barn in Tewksbury, Massachusetts. The suspect got away with her purse and her vehicle, which was later recovered in Wilmington. 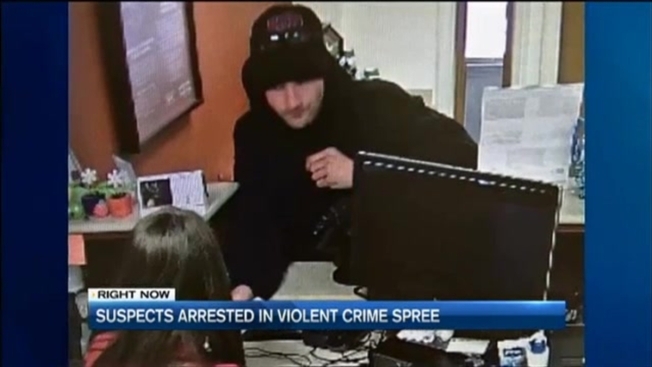 The suspect is also accused of robbing another bank Friday in Seabrook, New Hampshire. Munroe and Norton may have left their mark in another part of town, as well. An SUV the couple is accused of stealing in Derry was found abandoned on a rural trail.